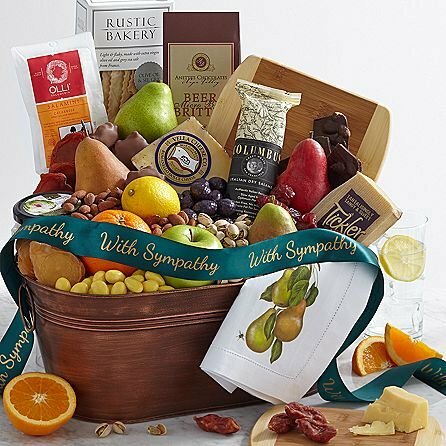 This incredible gift, inspired by America's culinary artisans, is the perfect way to send peaceful wishes, especially when you can't be there in person. From irresistible Tickler Cheddar Cheese and Olli Calabrese Salamini, to chocolate blueberries, dried yellow peaches and Anette's Fiery Beer Brittle, this is a gift they'll appreciate with each delicious bite. They'll also receive fresh pears, crisp apples and more delicious fruits. For a beautiful finishing touch, we've presented this collection in a reusable copper tote and included a playful linen napkin, bamboo cutting board and elegant sympathy ribbon. 2 D'Anjou Pears 1 Crimson D'Anjou Pear 1 Granny Smith Apple 1 Beurre Bosc Pear 1 Navel Orange 1 Lemon Rustic Bakery Olive Oil and Gris Flatbread (6 oz.) Olli Calabrese Salamini (3 oz.) Columbus Dry Italian Salame (8 oz.) Tickler Cheddar Cheese (7 oz.) Vella Romanello Cheese (7 oz.) Artichoke Dip (7 oz.) Roasted Salted Almonds (3 oz.) Roasted Salted Pistachios (3 oz.) Anette's Fiery Beer Brittle (4 oz.) 4 Pecan Clusters Dried Yellow Fancy Peaches (3 oz.) Dried Fancy Pears (3 oz.) Lemon Crème Almonds (3 oz.) Dark Chocolate Almond Bark (3 oz.) Chocolate Blueberries (3 oz.) Dried Angelino Plums (3 oz.) Bamboo Cutting Board Approx. 8" x 5.5" Linen Pear Napkin 20" x 20"